This practical guide provides clinical pharmacologists, pharmacists, and physicians with a valuable resource to help move traditional drug therapy beyond a memorized ritual to being a thoughtful quantitative process aimed at optimizing therapy for each individual patient. 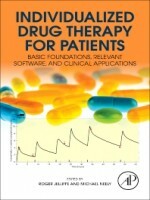 It uses pharmacokinetic approaches as the tools with which therapy is individualized, provides examples using specific software that illustrate how best to apply these approaches and to make sense of the more sophisticated mathematical foundations upon which this book is based, incorporates clinical cases throughout to illustrate the real-world benefits of using these approaches as well as focuses on quantitative approaches that maximize the precision with which dosage regimens of potentially toxic drugs can hit a desired therapeutic goal. Individualized Drug Therapy for Patients: Basic Foundations, Relevant Software and Clinical Applications focuses on quantitative approaches that maximize the precision with which dosage regimens of potentially toxic drugs can hit a desired therapeutic goal. This book highlights the best methods that enable individualized drug therapy and provides specific examples on how to incorporate these approaches using software that has been developed for this purpose. The book discusses where individualized therapy is currently and offers insights to the future.